Many associate the term ‘vegan’ with food, however there are many other components of vegan lifestyle which include vegan beauty products as well. Essentially, vegan cosmetics are make-up, hair care and skincare products that do not contain animal-by products or ingredients derived from animals such as lanolin, collagen, gelatin, albumen, carmine, beeswax etc. Vegan cosmetics are in many cases cruelty-free and never been tested on animals, however the two terms don’t always go side by side. If you are curious about vegan-friendly beauty products and how you can benefit from them, there are strong reasons that might help you make an ethical choice and switch to vegan cosmetics for good. Vegan shampoo is a shampoo that contains no animal ingredients or animal by-products. It is completely free from any animal derivatives. This means vegan shampoos are made from plant-based ingredients only. Vegan shampoos contain different types of preservatives and surfactants, but that doesn’t make them less effective. On the contrary, vegan shampoos usually contain fewer ingredients, which are all plant derived and gentle, but work equally well. The same applies to vegan conditioners; they contain no animal-derived ingredients. Vegan shampoos and conditioners still contain ingredients that will clean and nourish the hair, they are just milder and thus suitable for sensitive hair and scalp. Their ingredients list does not contain synthetic and harsh chemicals. While nasty ingredients such as SLSs, parabens, dyes, silicons etc. can be harmful for everyone, they are especially bad for the youngest. This is why vegan shampoos and conditioners are also suitable for the whole family. They are also relatively unlikely to cause an allergic reaction. The lack of chemical compounds and animal-by products makes them a safer option for people with sensitive skin. Vegan shampoos and conditioners are also most likely to be cruelty-free. When it comes to cruelty-free shampoos and conditioners it means that neither they nor their ingredients are tested on animals. Thanks to their plant-based formulations without any harsh ingredients, vegan shampoos are safe for both hair and the environment. They are biodegradable and environmentally friendly. 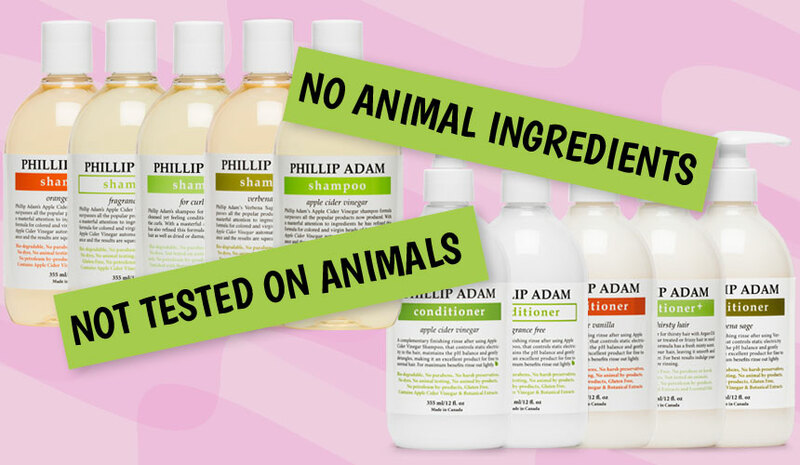 Fine, colored treated, virgin or curly hair type, Phillip Adam has a vegan shampoo and conditioner option for everyone. All our shampoos and conditioners are both vegan and cruelty-free. They deliver salon quality results and maintain healthy and shiny hair without the harsh chemicals. Skin is the largest organ of the body that has many protective roles. How you treat your skin on a daily basis reflects on your overall health and appearance. Vegan skincare products ensure your skin gets only the harm-free, plant-based nutrients that have beneficial effects on your whole body over time. Vegan skin care products don’t contain lanolin (an ingredient extracted from sheep’s wool) which is known to have pore clogging qualities. Vegan cosmetics are formulated with hypoallergenic ingredients that are gentle on the skin. Those who have sensitive skin or skin allergies, may find these products especially beneficial. Avoiding skin care products with harsh chemicals and animal-by ingredients is good for the body in the long run and prevents severe health conditions. Vegan skin care products are lightweight and rich in plant-based ingredients that easily hydrate the skin. Vegan cosmetics not only benefit your skin but also protect the animal world and the future of our planet. By choosing vegan beauty products you are choosing to fight key environmental problems such as climate change, water scarcity and reduce carbon footprint. 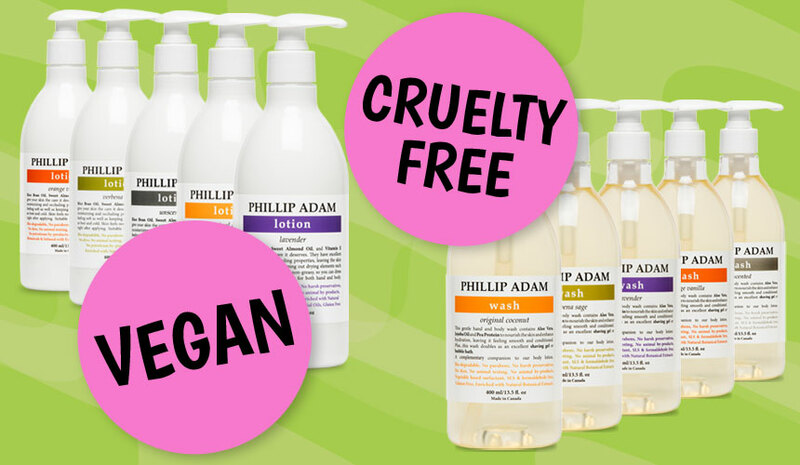 Phillip Adam skincare products are all vegan and cruelty free, crafted with care for your health and the environment. Our vegan lotions are formulated to give your skin only the safest plant-based ingredients that are easy to absorb and provide maximum skin hydration. Phillip Adam vegan lotions are infused with natural oils of Rice Bran and Sweet Almond, gently moisturize your skin and protect it from outdoor elements. To best start your vegan skincare routine everyday, use our vegan body wash collection available in several energizing scents derived from pure essential oils such as Coconut, Lavender, Verbena/Sage and Orange/Vanilla. Powerful ingredients of Aloe Vera, Jojoba Oil, and Pea Protein will leave your skin clean and hydrated each morning. 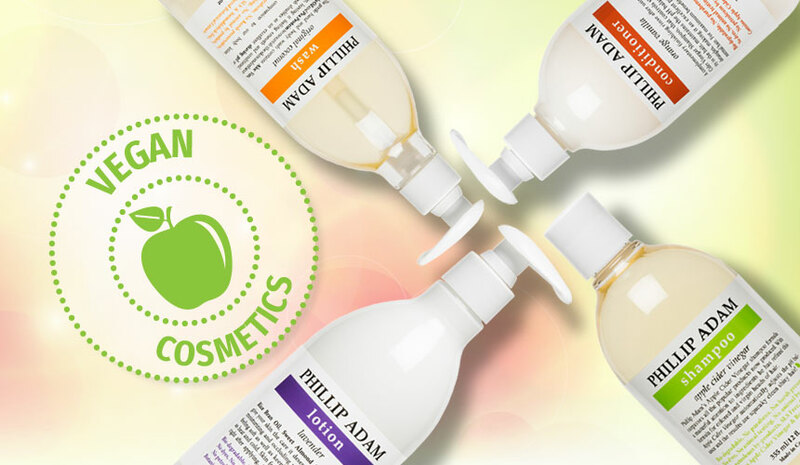 Indulge your senses and reap the benefits of vegan cosmetics with Phillip Adam hair and body products.